Like it or not, I was once a ‘Crusader’. I lived a life dedicated to ‘saving’ people; from themselves, from others, from ‘things’. Who else could perform such a critical role? After all I was a Safety Manager, and with that, a bastion of all knowledge about risk. I even had a consulting business named Dolphin Safety Solutions. I’d put some thought into this name as dolphins were something special to me; they are great communicators, they travel together and look out for each other and they are known for their intelligence. But what did I really understand of intelligence? While intelligence is great, if we don’t understand our ontology (reason for being) or how we ‘know’ (epistemology), we can easily be deceived into thinking that such knowing will lead us to a happy, fulfilling and rewarding life. Our modern world seems to place a special value on intelligence. However, if the only reason for knowing is to be the ‘smartest person in the room’, that to me indicates a life of ‘I’ rather than ‘thou’ (Buber). A tension that we all must live with if we are to be fallible beings in this world? 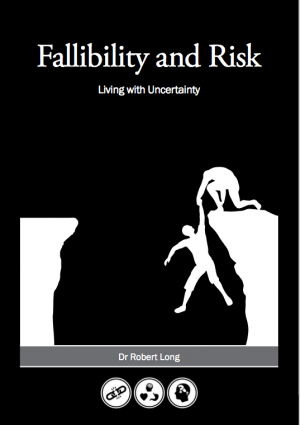 Welcome to Fallibility and Risk, a book not for the feint hearted, but one that just may challenge you enough to push you into ‘cognitive dissonance’. This is a book about life and also about death, about risk and also security. This book may provide some answers, but maybe raise many more questions. This I’ve learnt, is the very nature of our ‘being’; it’s paradoxical, where seemingly things that should not co-exist, do. As we aim to make some sense of all this, we also realise that such sense may seem absurd. Yet we still seek to know our ‘being’. 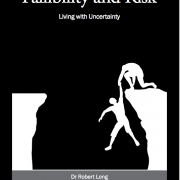 The book is the latest in a series of books on risking, living and discerning. All ‘doing’ words, and things we all ought to do if our aim is to ‘be’ in this world. Yet doing such things and experiencing life also means that we must live with uncertainty and unknowing. The alternative is to be safe and secure. However, as I’ve learnt over the past five years, Risk cannot be ‘solved’ or ‘ fixed’, rather, it defines our living and being. What a challenge to understand fallible being; especially if we believe life is about answers, rather than questions. So, what can you expect as you venture through a book written by someone who seeks to help us understand; ourselves, our world and what it does to us? To start, you’ll read about thinkers such as Kierkegaard and Heidegger; they weren’t among the recommended authors when I studied ‘solutions’. You’ll also hear stories of risk through movies, such as Indiana Jones; not from the perspective of some Risk Matrix or control, but rather ‘exegesis’, religious symbology and myth. I don’t recall learning about any of these in my undergrad degree in objects; yet, they are so critical if our aim is to tackle, rather than eliminate risk. We also learn about hope, faith and importantly fallibility in this book. These were not words that I considered in 2012, when I started my consulting organisation focused on ‘solutions’. Not long after I started consulting in ‘solutions’, I started my own spiral into cognitive dissonance. is began after reading Risk Makes Sense. It’s also the year that I met Rob Long. Rob is no hero of mine, nor is he a superhero at large. Rather, he is a teacher, mentor and friend. He was the instigator of a learning adventure, one that would change my life in a way that I could never have imagined, rather only experience. For example, it was in Austria in January 2017, as my dear friend Gab Carlton and I took comfort from the snow and freezing conditions outside, that I first heard the term ‘perichoresis’ in a casual conversation. It was in the relative comfort of a restaurant in Linz ironically the hometown of Hitler, that I learned about the paradox of legs broken while at the same time carrying demonstrated in the mythology of the kriophoros. Time again, I have experienced being carried, where the pain is shared. Yet I did not realise, nor fully appreciate, how critical this was for learning, growing and developing. Don’t get me wrong, I’m still regularly seduced to the ‘crusade’, it’s hard to avoid in our world of hero’s, answers and ‘solutions’. However, now as I struggle through life, I can recognise the cues when crusading prevails. I’m grateful for that, which is not to say that it does not continue to challenge me. Such is ‘living’ in the dialectic! As I try to make sense of all this, I now feel some comfort in not knowing, instead my focus these days is on contemplating and reflecting with a new intelligence. Reflection did not occur when I was caught up in process, saving and protecting! Crusaders need not reflect, for they already know everything! Thankfully though, reflecting is now a daily ritual. When Rob first sent me a draft of this book, I initially noticed some mistakes; in spelling and in grammar. Isn’t it interesting what takes our attention if our focus is on saving and fixing? However, as I reflected on what the book was saying to me, and on the questions that it asked me, these trivial details drifted away and I opened myself to learning; rather than policing. It was quite liberating, while also a cause for some anxiety. Maybe this will be the same for you? Learning is not always easy, it’s about change after all. One thing I’ve learned about learning though, is the importance of ‘readiness’. Are you ready for what is offered in this book? I knew, and recognised that being the ‘smartest person in the room’ with the answers, was actually part of a bigger problem, not a solution. This was such an important learning for someone intent on ‘saving’. I now value questions, rather than answers. This means that instead of fearing death, fallibility and harm (all of which have no answers), I now aim to embrace life, with all of its ups and downs and bits in between. Instead of saving others and seeing them as objects, I now see and connect with people, because after all, as Martin Buber (1958) suggests; “All real living is meeting”. I learned a lot from reading, and questioning this book. I hope you do too.